From a young age, Aguiar always knew running would be her sport. “My parents both ran so track has always been a big thing in my family. I wasn’t really good at anything else. I don’t have great hand-eye coordination, but I’m really good at running, so I knew that was where my athletic skills were,” Aguiar said. Photo courtesy of Macalester Athletics. 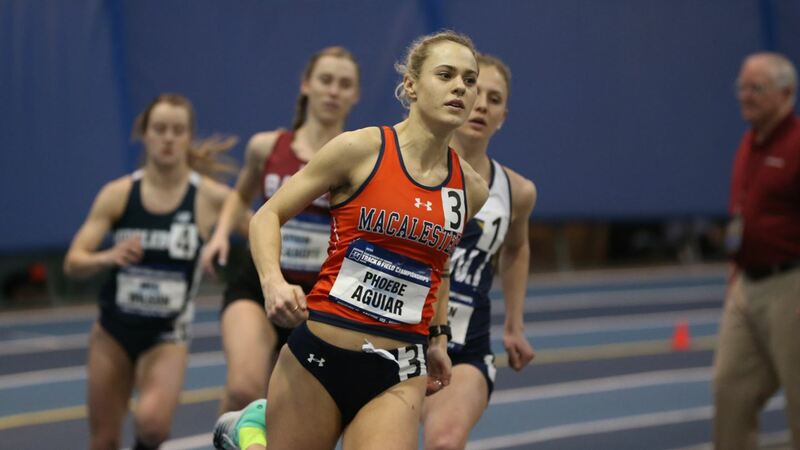 On her decision to go to Macalester, Aguiar was not only looking for the opportunity to run but also somewhere where academics were also a priority. “I knew I wanted to go to a liberal arts school. I wanted a coach that would let me study abroad… Track was not the deciding factor, but it was definitely a big contributor,” Aguiar said. Aguiar came into her senior season with even higher expectations. “Last year, it was about making it to nationals and this year it was winning,” she noted. “I knew I would make it, so it was just a matter of placing as high as I can.” Looking back at the previous season when she won silver at Nationals, Aguiar said that it “was a big shock. I’d say it was a bigger surprise to everyone than winning this year. Just because I ran so much faster than I ever had and definitely came in not a favorite to do that, but it definitely made me want it more [this season]. It wasn’t a disappointment to come second, it was a huge accomplishment… It was really good motivation.” When it comes to motivation, Aguiar did not have trouble finding it in-season. “The nice thing about running is… it’s pretty black and white, it comes down to time so just being able to get my times down.” While Aguiar will be graduating from Macalester in May, in the fall, she will compete in Division I for Syracuse University while pursuing her Master’s in Public Policy. “Next year I’ll be doing this but at a much higher level so I got to do the best I can now to get myself to a place [where] it is more competitive [where] people are that much better so that’s been a pretty easy motivator,” Aguiar said. On her goals for Division I, Aguiar believes the training will be even more intense. “I’ll be a lot more committed to it… I think it’s pretty similar, it’s making it to nationals, being an all-American, just at a different level. After I would want to get enough exposure that I could consider running professionally,” Aguiar said. Looking towards the future, Aguiar has more than just Division I in her sights. Next year, as Aguiar runs at Syracuse University, she will look towards the upcoming Olympic games. “Just to qualify for trials, that would be amazing, just to have that experience, and trying to see how far I can take this,” Aguiar remarked.